Seasonal deal: save 10% Breakfast Buffet. Free High-Speed Internet. 2989 Paradise Road | With a stay at SpringHill Suites by Marriott Las Vegas Convention Center, you'll be centrally located in Las Vegas, a 2-minute drive from Las Vegas Convention Center and 5 minutes from Fashion Show Mall. This hotel is 1.5 mi (2.5 km) from SLS Las Vegas Casino and 2.1 mi (3.3 km) from High Roller. Make yourself at home in one of the 299 air-conditioned rooms featuring refrigerators and flat-screen televisions. Complimentary wired and wireless Internet access keeps you connected, and cable programming provides entertainment. Private bathrooms with bathtubs or showers feature complimentary toiletries and hair dryers. Conveniences include phones, as well as desks and separate sitting areas. With a stay at SpringHill Suites by Marriott Las Vegas Convention Center, you'll be centrally located in Las Vegas, a 2-minute drive from Las Vegas Convention Center and 5 minutes from Fashion Show Mall. This hotel is 1.5 mi (2.5 km) from SLS Las Vegas Casino and 2.1 mi (3.3 km) from High Roller. Don't miss out on recreational opportunities including an outdoor pool and a 24-hour fitness center. This hotel also features complimentary wireless Internet access, wedding services, and a ballroom. You can enjoy a meal at Palettes Gallery & Bistro serving the guests of SpringHill Suites by Marriott Las Vegas Convention Center, or stop in at the grocery/convenience store. Quench your thirst with your favorite drink at the bar/lounge. A complimentary hot/cold buffet breakfast is served on weekdays from 6:30 AM to 9 AM and on weekends from 7 AM to 9:30 AM. Featured amenities include complimentary wired Internet access, a 24-hour business center, and express check-out. Planning an event in Las Vegas? This hotel has facilities measuring 4600 square feet (427 square meters), including conference space. Self parking (subject to charges) is available onsite. 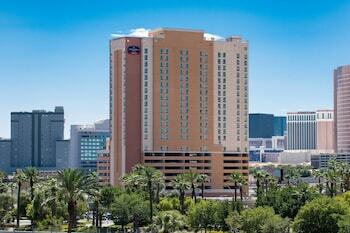 The preferred airport for SpringHill Suites by Marriott Las Vegas Convention Center is Las Vegas, NV (LAS-McCarran Intl. ).